RESTORING OLIVIA: More pieces to her puzzle ---- so now what? More pieces to her puzzle ---- so now what? New tests. New results....with different findings. New Pieces to her puzzle!!! Specific, individualized testing that is 100% Olivia, her genes and only hers. This is the kind of information I wish I had 16 years ago. With new information comes a new strategy...one that has emerged in the last couple months. A new strategy pointing her and I down a new path. For so many years, everything I tried for her was based on information for the "masses". We tried medication that worked wonderfully for most kids, but it didn't work for her. Biochemical supplement regime's that miraculously healed many children who regressed during toddler hood, but nope, not for her. Olivia always was the one that the intervention did not work. Searching for answers to complex health issues is never easy. Right? Often times these answers are referred to as "pieces to a puzzle" since most stories like Olivia's seem to be "mysterious" conditions that are not identified and/or explained in the medical community. Sigh. Sometimes, I think that I find new pieces and am hopeful for a moment until trial periods pass without any significant change. More recently though, I have learned that the medicines she's been on are like wrong pieces jammed into place, forcing adaptation of her unique puzzle until the edges are bulging out of place. Bulging and......causing problems. 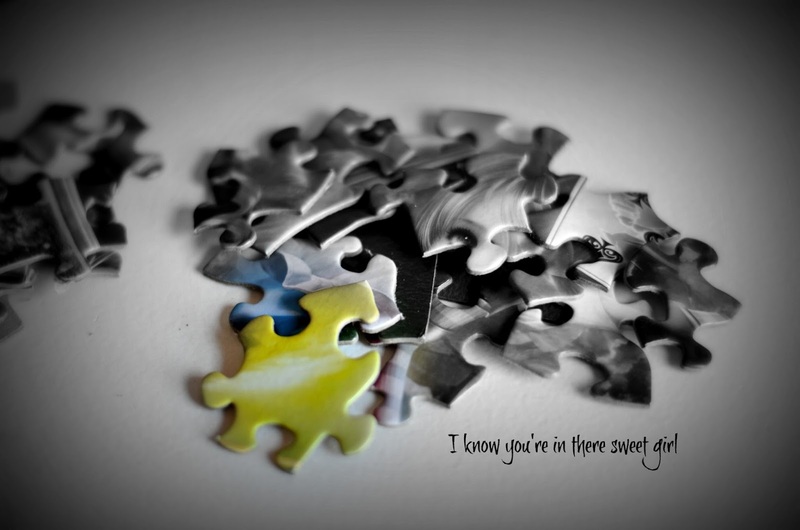 But, as we know, a puzzle piece either fits or doesn't fit - there is no in between. I've referred to her chronic illness in past posts as "Metabolic Mayhem" and there is a reason. Her hypersensitivity to any changes in her system sets her back until homeostasis is reached again. Dictionary.com defines homeostasis as : "the maintenance of metabolic equilibrium within an animal by a tendency to compensate for disrupting changes." Many times this can take days (magic number seems to be 4) or in some cases weeks. Why am I telling you this? Well.....even though I have new test results with new pieces, making the necessary changes in her diet, her medicine and her supplements mess up any homeostasis she has. I kind of liken it to turning a big semi around on a two lane highway. Although seemingly impossible, with the right care and time it most certainly could be done. Moving forward with hope, I view these new test results as the straight-edged pieces that, when locked together will construct the outline or the border separating where the remaining pieces will be housed, with hope they will interlock perfectly. I have always done my puzzles that way - get the frame done first, then fill in with groups of related colors/images. Not only do I have a new direction with new information, but also, I finally have several different doctors/experts who understand what went wrong and may know how to systematically piece Olivia's fragile little body back together - piece-by-piece. Although weaning her off the Keppra has been a rough piece withdrawal, it must be done. Her inability to break it down leaves a bigger mess for her fragile system to deal with. So many changes.....such little time. Yes, I am still weaning her. Ugh. I must admit something. I haven't written because I feel somewhat embarrassed. My pride envisions amazing updates for you, but the material just isn't here yet. Right now her story looks pretty much the same. Really good weeks are followed by an illness that takes her down for a week or more. I feel a wave of relief when she is finally able to crawl out of the black hole that sucked the life out of her. I continue to be eternally grateful for the Medical Cannabis, it is the only thing that has given her the monthly reprieve. Medical Cannabis is a miracle maker! I'm thankful and I want more of this sort of good! I'm not very good with disappointment and setbacks. God has sort of been silent at this stage of the game, and that's ok. I choose to go deeper with him. I pray. I repent. I forgive. I believe. I withhold the will of my struggling heart to shout "What's taking so long Lord"?! I was talking with a friend the other day. A friend that knows the difficulties Olivia has faced with non compliance of almost everything we've tried. She said such a profound statement. She said, "It's like feeling your way in the dark." That is my journey in one sentence. Feeling my way in the dark. Remember.....I've been walking this road for 16 years, not 16 days. Being alone in the dark isn't fun; it can be down right scary. No wonder I'm always so scared. Scared of making the wrong change. Scared of making too large of a change. Scared I'm not moving fast enough. Scared I am moving too fast. Scared I'm not giving her body a chance to adjust. It's just so exhausting isn't it? Olivia's path to wellness isn't clear, like so many other people who suffer from complex chronic illness. We pray for that miracle. We partner with God with faith. And we wait. Remember the story of the missing axe head in 2 Kings 6:1-7? It's the story of a couple of men who are set to build a house. While working, their borrowed axe head flew off the handle and landed at the bottom of the Jordan River. The most important tool for them to move forward with their plans of rebuilding is lost - down in the deep, dark water. There is no way they could find that master piece on their own. I can relate......it's like feeling your way in the dark. Their answer was Elisha - a powerful prophet of God's. After learning where it had fallen, he took a stick and threw it to that spot and the axe head floated up to the top where they were able to grab it and move on with their building. They wouldn't have found it without him. They had Elisha, we have Jesus. Only the True Healer knows the way out of the dark and that is who I am trusting. Remember, his "perfect love drives out fear" (I John 4:18), which includes my fear in the dark corners.....the dark shadows of her complex puzzle. He stops me from expressing the human reaction to fear --- the feeling of needing to run away, abandon my hope and take flight. Onward is over rated - I point you Upward until next time!